We’re well into the first month of 2019. Christmas feels like a lifetime away and we are all eagerly waiting for the next big day of the year – payday! Valentine’s Day is the next key event on the yearly calendar. We know it can be incredibly challenging to find the most romantic thing to surprise your partner with at this time of year. Chocolates? Dinner? Flowers? Why not think outside the box this year and treat your loved one to a super romantic Valentine’s Day themed speedboat adventure?! Not only that but this year we are offering a ‘bring your loved one for free’ offer! Shhh… don’t tell them though. There’s no need. Take the credit and be the hero (or heroine!). You’ll even have plenty of change for dinner afterwards. Other big dates coming up this year are Mother’s Day (by the way – the same day the clocks go forwards – 31st March 2019) and Father’s Day (June 16th 2019) where we make a big fuss of any and all parents on board! Each trip will have especially themed music to get Mum moshing and Dad dancing! Our Easter Eggs-pedition (13th April 2019 – 22nd April 2019) is set to have kids of all ages spying out London’s most famous landmarks in a bid to win a chocolate treat. 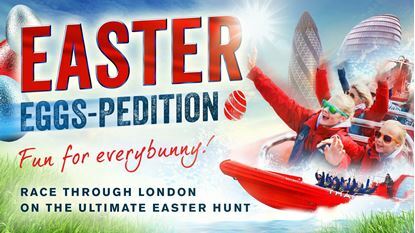 Armed with treasure maps you and your family will set out on a sweet speedboat adventure so dust off your bunny ears, pack your Easter eggs and hop on down to the London Eye Pier for the experience of a lifetime! Then before you know it we’ll be whizzing into the summer season. There’s nothing better than flying around on our #1 speedboats on long, warm summer days. So whilst it may seem like a lifetime away there is plenty we have lined up to keep your year adrenaline fuelled and filled with memories.